Can empathy really hurt your career? Read this and let’s see what you think. “Ken was a mid-level manager at a recruitment firm. Folks saw Ken as a “good guy.” He was well-liked by his employees and on good terms with upper-management. His team felt comfortable confiding in him; they often used his open-door policy to share their personal problems. When Ken got word from upper-management that his team brought in the lowest numbers that quarter, he immediately knew the cause. Caitlin—previously the team’s top-earner—had been off her game for months. Her father’s poor health had caused her to miss work and diminished her productivity and focus in the office. Ansh’s work had also been suffering. Ken knew Ansh had been through a break-up recently and wasn’t taking it well. In both instances, Ken hadn’t interfered. He knew the company’s bottom-line was being affected, but his empathy for Caitlin and Ansh kept him from giving them critical feedback, crucial for getting them back on track. Ken simply hoped their lackluster results would improve with time. They didn’t. And Ken’s reputation at the firm suffered. We often talk about leaders who lack emotional intelligence, but a distortion in EI can also go too far in a leader. Empathy is a critical competency for understanding others’ points of view and finding common ground with people whose experiences differ greatly from our own. But great leaders also balance their empathy with strengths in other competencies. Coleman makes a good point, and opens a much bigger question he didn’t deal with. If you have a culture of truth-telling, you would avoid the problem Goleman points out. Actually, I think it’s more conflict avoidance, which is RAMPANT in corporate america. Empathy isn’t about engaging or not engaging. It’s about understanding another’s viewpoint, being aware of your emotional landscape, mutual vulnerability and it can be used as an interruption of power. Great leaders don’t avoid discomfort and they consistently engage in difficult conversations. They use empathy as part of their process to understand what’s going on and to get more accurate information. There are a very small amount of companies who have a culture like this. And I’ve never seen a large organization prioritize enough to make it a reality. This conflict avoidance makes a huge negative impact on the bottom line and key metrics. 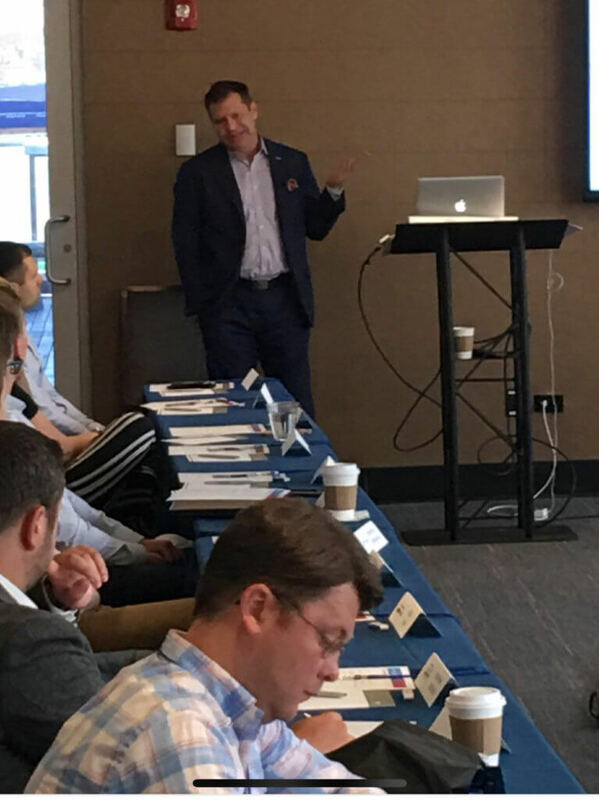 I had a fantastic time last week speaking on building the highest performing teams at the Logistical Labs Customer Event in Chicago. We also played my game, Cards Against Mundanity, a team build game where participants share their life experiences through questions and answers in small groups from 4 to 12 people. It’s similar to Cards Against Humanity, but more fun, more vulnerable, and more about your life. It’s amazing to see how animated people get, their voices getting louder, everyone leaning in, smiles on their faces, and it’s hard to get them stopping talking! They were a great inquisitive group of managers and leaders from across the United States that cared deeply about serving their clients and organization. Logistical Labs, makers of LoadDex, are the SaaS platform for collecting, analyzing, and acting on supply chain data. With their suite of analytics products, users can make better informed pricing and quoting decisions through data-driven insights and social collaboration. Open API access allows users to easily integrate products into their existing business applications for improved process efficiency. Logistical Labs was named a Top 100 Logistics IT Provider by Inbound Logistics in 2018. 360-degree feedback programs have received a lot of negative (and justified) attention over the last few years. Even Dilbert has parodied the process. However, 360-degree feedback done right can be a very valuable process that significantly influences teams and organizations. It provides an outside perspective into an individual’s (often unconscious) habits and behaviors that sabotage their success. These are areas such as an inability to compromise, conflict avoidance, micromanaging, poor communication or collaboration, etc. Why Should You Do a 360-Degree Review? According to Dr. Tasha Eurich, while most people believe they are self-aware, only 10% to 15% are. Self-awareness is very rare quality for a person to have. So most people walk around not understanding the true impact they are having in their organization. While it’s easy to see what’s wrong with everyone else around us, it’s hard to see similar things in ourselves. The way our brain is wired makes it extremely difficult to self-examine ourselves to see our unconscious thoughts, feelings and behaviors. The human mind is not rational, but driven by emotions. We make up stories in the absence of hard data (i.e. 1+1=2). Our mind is also wired to reward us for making quick meaning of situations through chemical releases such as oxytocin. The more experienced and senior a person’s role is in an organization, the more likely they are to overestimate their skills, abilities, and competencies. One study of 3600 senior leaders found that they overvalued their capabilities in 19 out of 20 areas. Therefore, receiving external feedback is extremely important in helping people understand what they are doing, thinking and feeling and the effect it has on those around them. Armed with this information, individuals have a much higher chance of creating critical behavioral changes. Unfortunately, the 360-degree process is broken today and needs to be changed. Click here to read on to How to Conduct a Great 360 Degree Review from my article in HR Magazine (Hr.com). Testimonial for my Team Building Workshop at the Hispanic Chamber of Commerce in Fort Worth. “Our group of ambassadors enjoyed your team building presentation and excited to try the game with their team/organization.